St. James Trade School trained boys, originally orphans, for such jobs as mechanic, baker, the building trades, butcher and others from 1930 until 1972. 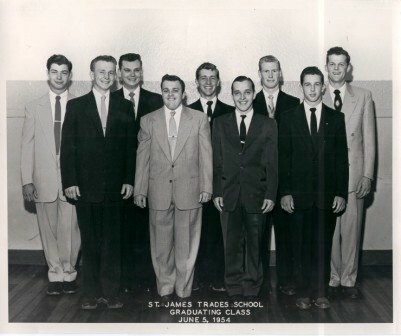 St. James was a boarding school from 1930 to 1963 and then became a day school. Its largest graduating class was 29 in 1969. After the school closed, the facility northeast of Springfield was converted to Brother James Court, an intermediate care facility for mentally disabled men. Both the trade school and Brother James Court have been ministries of the Franciscan Brothers of the Holy Cross, an order founded in Germany in 1862. More information: The following “quick facts” come from Illinois Glory Days, a website devoted to the history of no-longer-existing high schools in the state. Much more information is available from the Illinois Glory Days entry on St. James. Thanks to Phil Shadid for directing us to Illinois Glory Days. The April 2007 issue of Historico, the Sangamon County Historical Society newsletter, has more on Brother James Court. This entry was posted in Churches, Education, Schools and school districts. Bookmark the permalink.